What is Matthew all about? Why does it look the way it does? In this episode Judy Stack takes us to school and helps us to see the Gospel in a new light. Having grown up being told her body was bad, Linda Kay Klein was on a mission to hear from women about their own experiences with Purity Culture. In this episode we talk about what the Bible has to say about sexual purity and maybe more importantly, what it doesn’t. When people find out that the Bible is ancient, ambiguous, and diverse, they often ask, "Is the Bible true then?" Pete and Jared dive into the topic and talk about how truth–in the Bible–is subjective. What does it mean to remain faithful to the Bible but also have a moral imagination that might extend beyond the Bible? How can that be done? We talk with Jonathan Walton about how he connects those dots and why he feels it’s the way to remain faithful to the Bible. This week on The Bible for Normal People, we have Austin Channing Brown as our guest. She shares about her experience growing up in various churches and what we can learn from black churches - especially when it comes to preaching the Bible. There’s a lot more going on in the book of Exodus than what you’ve seen on the big screen or heard in church. More than a story of deliverance, Exodus is a subtle literary creation that contains many surprises when we read it closely. Join Pete here for Part 1 of this series where he looks at some big picture issues (like “did it happen?”) before walking us through the themes of chapters 1 and 2. Anxiety in the life of faith is a conversation that needs to happen more often. Elizabeth Enns Petters talks with us about her journey and how her old views on the Bible contributed to her anxiety and how her new views on God and faith have given her a new perspective on life. In this episode, Pete & Jared talk to Xavier Pickett about the Bible and slavery, the Bible and race, and the importance of theologian James Cone. We talk often about how the Bible isn’t opposed to culture but is deeply embedded in it. Rhonda Burnette-Bletsch shows us how true that is in film by walking us through a few popular movies and how they relate to the Bible. You can find Rhonda's list of movies at the end of this blog post. Hip Hop artist Propaganda joins Pete and Jared for the season 3 opener and shares some deep—and we mean deep—thoughts about the music industry, artistic integrity, and what being Christian in all that means and doesn’t mean. In this episode, Jared and Pete look back at all of their guests in Season 2 to talk about language, history, and how personal experiences can't help but affect how we read the Bible. All in the effort to ask that perennial set of questions: What is the Bible and What do We Do With It? In this episode, Jared & Pete talk to Brad Jersak about how Orthodoxy views the Bible, and some other things, and how those differ from Evangelicalism. In this episode, Pete responds to an article from The Gospel Coalition entitled, "3 Beliefs Some Progressive Christians and Atheists Share." He takes issue with the harmful rhetoric that polarizes Evangelicalism creating an "us vs. them" mentality among brothers and sisters in Christ. He points out that Progressive Christianity shouldn't be a pejorative term but one that describes a creative and inquisitive faith seeking to evolve with their understanding of the scripture. In this episode, Pete & Jared talk to Jonathan Merritt about the language of scripture, how it's changed over the years and how our interpretation and understanding must adapt to fully appreciate what the Bible has to say. In this episode, Jared takes us into the book of Jeremiah and delves into some of the historical and cultural signifigance of the text. In this episode from Season 1, Jared and Pete talk to Dr. Kent Sparks about the origins of the Israelites. Along the way they get into the nature of the Bible, the nature of the Christian faith, fundamental theological issues like soteriology, and the nature of God. After all, you can't talk about anything without talking about everything. This week Pete & Jared sit down with Kevin Makins, founding pastor of Eucharist Church in Hamilton, Ontario. They talk about community, how he reads the Bible and how it informs the culture of his faith community. What does the Bible have to say about politics? Nothing, really. On the other hand, a lot—but not the way many tend to think. Rather than supporting a political agenda, the biblical story challenges us to hold those agendas to account when they fail to promote justice. What is needed more then another clever politician with resources to ram things through are prophetic voices that remain distant from adopting wholesale any party ideology. This week, Jared & Pete talk to Brent Strawn about the Old Testament. They discuss some of the common criticisms of the Old Testament and how the modern Church has over-emphasized the New Testament much to its detriment. In this episode, Pete & Jared discuss the value that creeds have in shaping the way we practice our faith. And how they can sometimes fall short, as demonstrated by the modern Statement on Social Justic & The Gospel. In this episode, Jared & Pete talk to Mark Smith about the origin of Yahweh and how the term was understood in the first century. In this episode, Jared tackles the question of how to engage with people that believe differently that we do. Many times we're guilty of shutting down the conversation and alienating people with opposing viewpoints rather than seeking to hear and understand their perspective. Jared shares some excellent tools in helping us move the conversation forward. In this episode, Jared & Pete talk to William M. Schniedewind, professor of Near Eastern Languages & Cultures at UCLA. They discuss the challenges of accurately capturing the oral tradition of the Hebrew scriptures and what we can learn from looking at the history and context of how it was written. Benjamin D. Sommer, "Revelation & Authority"
Benjamin D. Sommer, "Jewish Concepts of Scripture"
Benjamin D. Sommer, "The Bodies of God and the World of Ancient Israel"
Benjamin D. Sommer, "A Prophet Reads Scripture"
In this reissue from Season 1, Jared and Pete talk to Rachel Held Evans on wrestling with doubt, how women are portrayed in the Bible and loving the scriptures even through personal doubt and deconstruction. In this episode, Jared & Pete answer questions submitted from The Bible For Normal People community. In this episode, Pete & Jared talk with Sarah Bessey about her background in the Word of Faith movement, her deconstruction, and her journey to finding freedom in the Scriptures as she learned to read and understand it in a new way. They also discuss how to raise kids with strong faith without transferring your own doubt and theological baggage to them. In this episode, Pete takes a look at 9 things you need to know to get the somber book of Ecclesiastes. He cautions us against an optimistic reading as the author intends to question everything—even God. It's a book that's not for the faint of heart (or for the new believer), as you need to have weathered the storms of faith to fully appreciate the tough questions being asked . . . and ultimately, the hope found within! In this episode, Pete and Jared talk with Jamie Wright, whose experience as a missionary in Costa Rica had led her to question the church, missions and evangelicalism all while retaining her deep love for and faith in Jesus. In this episode, Pete & Jared define critical thinking and unpack what it means to read the Bible critically. They suggest that a "God said it, that settles it" approach to scripture may not factor in the context, audience and literary style that the author employs in writing. Thinking critically about how we approach scripture allows us to experience the fullness and richness of the text. In this episode, Pete & Jared speak with Jeffrey Stackert about the origins of the Pentateuch, or the first five books of the Old Testament. Rather than looking at the books as separate works written by Moses, they discuss the documentary hypothesis which suggests that the Pentateuch was compliled from four sources. And many of the contradictions in the text may actually be indications of converging viewpoints from editors including or omiting details to preserve the integrity of the text. In this episode, Pete & Jared speak with recording artist Audrey Assad about her music, her theology, and the shift from her conservative fundamentalist roots to Catholicism. In this episode, Pete (joined by his cat Marmalade) shares 10 things essential to understanding the book of Romans. He's quick to point out a number of varying opinions about this important letter and suggests that the ways in which we've come to understand Paul's writings may be incomplete at best. And the trite ways that some of the more familliar passage have been recited are far from Paul's original intent. In this episode, Jared & Pete talk to Craig Allert about how the canon of scripture was curated. They also discuss the doctrine of "sola scriptura" and how the intertestimental books can be beneficial in bringing addition context and detail to our understanding of scripture. This week Jared walks us through the ways in which the Bible is true and in some ways untrue. He'll start by unpacking what we mean when we talk about truth and give us some helpful insights into how we can approach historical facts that sometimes seem to be at odds with the Biblical text. In this episode, Jared & Pete talk to author, teacher and Episcopal priest Barbara Brown Taylor. They discuss the many different stages and "human fingerprints" involved in getting the Bible from the original manuscripts to the printed translations that we read, including our own theological history and tradition. In this episode, Pete & Jared talk to William Paul Young, author of the NY Times bestselling book and feature film, "The Shack." Young describes his thought process behind his controversial portrayal of God the Father as an African-American woman and reminds us that we all bring some level of interpretation to the Biblical text. On this week's episode we have Fr. Richard Rohr to talk about a contemplative approach to the Bible. On this episode, we talk with Peter Rollins about how Christians have made the Bible (along with their views of God) into a "sacred object.” And, spoiler alert: that's actually not a good thing. Archaeologist Cynthia Shafer-Elliott turns a 2D Bible into a 3D picture by digging up artifacts from everyday ancient Israelite life. These were real people with real habits and customs that we never really see on the pages of the Bible. In this episode, Pete Enns works through 7 big-picture issues that help us see what Proverbs is all about and why the idea of Wisdom is such an absolutely central and vital biblical concept that many know very little about. In this season 2 opener, Pete & Jared talk with Jen Hatmaker about what can happen, emotionally and relationally, when you change your mind about the Bible. And how to survive it with your faith intact. Here's a glimpse of what's coming in season 2 of The Bible for Normal People, featuring Jen Hatmaker, Barbara Brown Taylor, William Paul Young, Brian McLaren, and Cynthia Shafer-Elliot. On this episode, Pete and Jared speak with Carolyn Custis James. Carolyn is an award-winning author who thinks deeply about what it means to be a female follower of Jesus in a postmodern world. On this episode, Pete and Jared speak to New Testament scholar Anthony Le Donne about The Gospels as memories of Jesus rather than strictly speaking "historical" accounts. Le Donne is the author of several books on Jesus and the Gospels and also edits the Journal for the Study of the Historical Jesus. On this episode, Pete and Jared speak with Drew Hart about race and the Bible. Hart is assistant professor of theology at Messiah College, author of Trouble I’ve Seen: Changing the Way the Church Views Racism, and an activist with ten years of pastoral experience. On this week's episode, Jared digs deep into that theologically deep, literarily complex, and definitely not "children's story," the book of Jonah. This week's episode looks at Womanist Biblical Interpretation with Pete and Jared’s guest Nyasha Junior, assistant professor in the department of religion at Temple University in Philadelphia. She writes, teaches, speaks, and frequently tweets on race, gender, religion, and their intersections. This week, Jared and Pete speak with Beverly Gaventa. Beverly is Distinguished Professor of New Testament Interpretation at Baylor University and Helen H.P. Manson Professor of New Testament Literature and Exegesis Emerita at Princeton Theological Seminary. Her latest book is called “When In Romans”. In this week's episode, Pete Enns lays out 5 things to keep in mind when reading the Adam story that will challenge your preconceptions, offer fresh points of view, and likely turn our entire political climate around for the better. On this episode, Pete and Jared talk with Hebrew Bible scholar and theologian Jon D. Levenson about where the idea of resurrection shows up in the Hebrew Bible and early Judaism, what it means when it does, and how some of that finds its way into the New Testament. This week Pete and Jared talk with speaker, author, and theologian Diana Butler Bass about her love for the Bible that has led her beyond code words and conventions to something deeper and more spiritually sustaining. On this episode of the Bible For Normal People, Pete and Jared talk with theologian Megan DeFranza (actually, Megan educates us) on a topic that affects deeply the lives of many, but that few Christians even know is a topic. And Megan might surprise you about what the Bible and church history have to say about it. This week, Jared Byas takes on his first solo episode. Since he's a plebeian and doesn't have his own Wikipedia page (unlike Pete), he begins with a little autobiography and the recurring theme of taking the Bible seriously but not literally. And encourages us, no matter how we read the Bible, to stop using "literally" altogether. This week on The Bible for Normal People, Pete and Jared speak to Denis Lamoureux on a topic that never seems to go away. Lamoureux is associate professor of science and religion at St. Joseph’s College in the University of Alberta. On this episode, Pete and Jared talk with Ellen Davis, Amos Ragan Kearns Professor of Bible and Practical Theology at Duke Divinity School, about the value of the Old Testament for Christians. On this week's episode, Pete and Jared speak with Brian Zahnd about violence in the Bible. Brian Zahnd is the founder and lead pastor of Word of Life Church (Saint Joseph, MO), and he writes, blogs, and Tweets regularly on the problem of violence in the Bible. His next book Sinners in the Hands of a Loving God is set to be released August 2017. On this episode, Pete and Jared talk with Marc Brettler on the conversation between the insights biblical scholarship, Jewish tradition, and the nature of the Bible. On this episode, Pete and Jared discuss how doubt in the life of faith is normal, biblical, and spiritually beneficial. On this week's epsiode, Jared and Pete speak with Ben Sommer, professor of Bible at the Jewish Theological Seminary (NYC). Christians have A LOT to learn from Jews about how their Bible works. In this week’s episode, Pete Enns explores "monolatry," the ancient Israelite belief that many gods existed but only one God, Yahweh, was worthy of worship. The ancient Israelites were not monotheists, and thinking they were obscures the theology of many passages by imposing an idea the Israelites would not have understood. New Testament scholar Daniel Kirk joins us this week to discuss the humanity of Jesus and why that shouldn't be obscured. On this week's episode Pete and Jared talk with historian and Old Testament professor Kent Sparks about the mysterious origins of the Israelites. On this week's episode Jared and Peter talk about their experiences with the challenge of teaching the Bible to children. On this week's episode of The Bible for Normal People, we speak with Amy-Jill Levine on understanding Jesus is his Jewish context. Levine is University Professor of New Testament and Jewish Studies at Vanderbilt Divinity School and the author of a number of books including Short Stories by Jesus: The Enigmatic Parables of a Controversial Rabbi. On this week's episode, we talk with Mike McHargue about science and faith. Mike is the author of Finding God in The Waves and the host of two popular podcasts, The Liturgist Podcast and Ask Science Mike. This week's podcast is a discussion of the state of the Bible in the mainline church with Old Testament scholar and theologian Walter Brueggemann. On this week's episode, we speak with Rachel Held Evans on unraveling and re-raveling the Bible. Rachel has written three best-selling books exploring her evolving journey of faith. 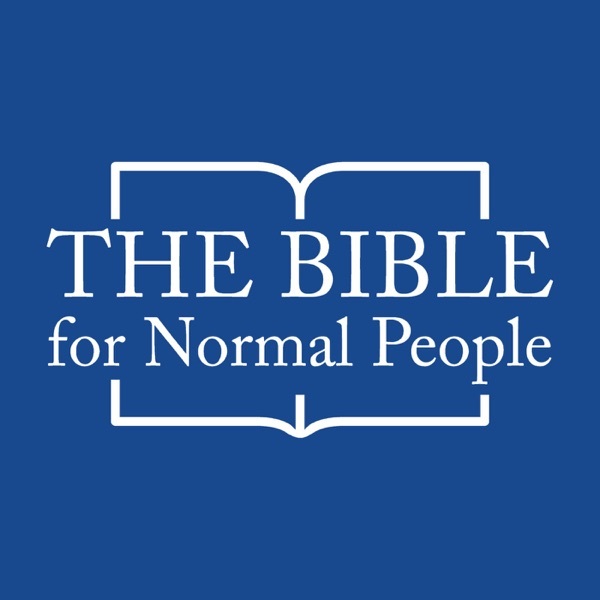 This is the introduction to Bible for Normal People: The Only God Ordained Podcast on The Internet. Serious Talk About the Sacred Book with Pete Enns and Jared Byas.